I don’t know whether to give this a 2 for below average or 3 for interesting. There were many interesting things in the book, but it lacked scientific research. Most of it felt like her personal opinion. Some of her advice follows. All food must be organic, no GMOs. Cattle must be organic grass fed. Chickens must be raised outdoors cage free on organic food. All animals must be antibiotic and hormone free. My understanding of GMOs: they are all different. Some corn is designed to make cattle get fatter faster. Other GMOs are trying to find a better tasting vegetable or one with more vitamins. Some GMOs are for better resistance to pests or pesticides. Some GMOs are for longer shelf lives. To my knowledge there are no studies that support the author’s recommendation to avoid all GMOs. She mentions no research. Instead of talking about how much salt to consume she says add no more than the tip of a teaspoon for the day. But the starting point is different for people depending on whether they cook or buy prepared foods. She should talk about milligrams for the day, not a tip of the teaspoon for everyone. She also recommends avoiding the commonly bought grocery store salt because it has additives. She prefers sea rock salt and pink Himalayan salt due to more minerals and no additives. But would this be undesirable? Grocery store salt might be the only way many of us get iodine in our diet. She does not discuss iodine. She says there is debate over how much water we need. Some experts recommend eight 8-ounce glasses per day. So that is what she recommends. She says purified water is incapable of hydrating the brain, but she has no study or research supporting that statement. The author made confusing statements about neurons. Early in book she said neurons are irreplaceable. Later in the book she said neurons continue to grow. And later she said a reduced calory diet promotes growth of new neurons. I was intrigued with Johanna’s review. She said the 1998 study by Dr. Fred H. Gage and Peter Eriksson found that the human brain can give rise to new neurons throughout life. They also found that exercise and cognitive enrichment can increase the brain’s ability to generate more neurons. This author made no mention of this. Blue Zones are five regions in the world where people live to be 100. They have the lowest incidence of heart disease, obesity, diabetes and dementia. I wish the author would have given a complete list of foods consumed in each area. She did not. She mentioned a few foods in each area. I did find some of the differences interesting. Americans are 8 times more likely to get Altzheimers than Indians. Although Indians have shorter lives. Some believe that curry spices (turmeric and cumin) are the reason for the lower rate of Alzheimers. But there haven’t been enough studies to prove it. A thought: none of the Blue Zones consume curry. 368 pages. Book Copyright: 2018. Genre: Health Nonfiction. Very interesting and informative but with so much information, the audiobook needs an accompanying pdf file. Standard line on diet. Nothing new here. Even though I start the review saying there's nothing new here, let me be clear that I do not mean that as an endorsement of the content. Unfortunately, I was suckered into purchasing and reading/listening to this book based on how the author's qualifications were marketed. It turns out, she says nothing new about diet than what you hear in the mainstream press. Her nutritionist credentials are questionable (look them up) because the "certificate" she received comes from a place not well known for quality or cutting edge nutritionist training. But this isn't an ad hominem based on those credentials, rather it's based on how the book is sold as the 'Surprising science' behind the diet she recommends; there's nothing surprising and very little strong science behind the recommendations. If you have never heard of the so-called Mediterranean diet (an umbrella term that proponents use to justify their eating tastes and habits, as long as it includes olive oil, fish and red wine), then this is as good an introduction as any. But be aware that nutrition science is more unclear on what she promotes than she or anyone else lets on. And nutrition science has some actually more surprising conclusions bandied about than what you find here. She toes the line on what one is supposed to say about nutrition these days and she does nothing to challenge received wisdom. 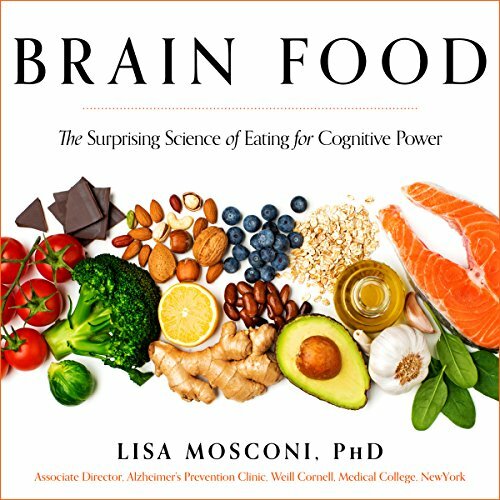 After hearing the author talk in TMHS podcast I expected in depth details on various processes related to nutrition of the brain. I was disappointed when hearing only fairly superficial information, even combined with outdated advice on for example cholesterol. Also, "the brain runs exclusively on glucose". Really? After hearing about Dr. Mosconi on Dr. Perlmutters website I had high expectations. I didn't find any new or surprising information.